It’s that time of year again! Yay! I planned out my garden a while back, and I’ve been waiting to start planting. 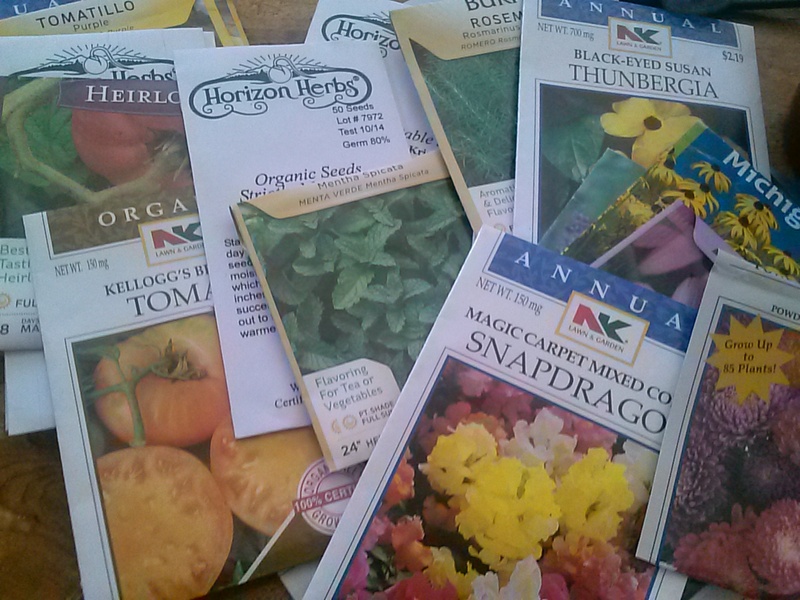 I have a pretty elaborate garden planned for this year, so I have a ton of seeds that I’ll need to start. I’m hoping to get everything into the ground at the very end of May. Two weeks ago, I figured out what needs to get started when, and separated them out into 4 groups – Start in April, Start in May (beginning), Start in Mid-May, and Direct-Sow. These are based on how quickly the seeds will germinate/grow large enough for outside. These groups were put into quart size plastic bags, since each group had quite a few seed packets in it. The day I sorted everything, I realized there were some seeds that needed to be put in the fridge for awhile, which meant they should go into the fridge THAT day. So that day I started some Comfrey and Datura and some other things. The cold of the fridge isn’t completely necessary but can help the seeds germinate. Those will come out of the fridge on April 12th and get put into their window spot. 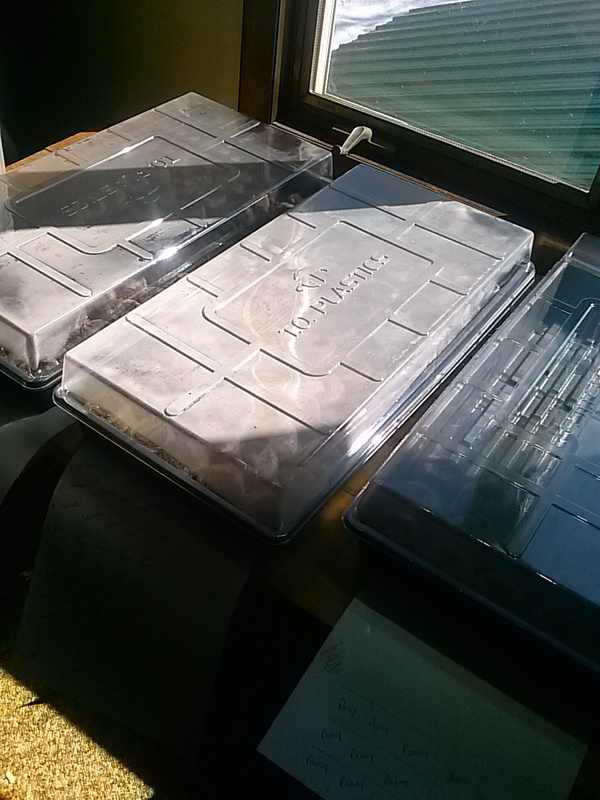 I have a south facing large window that I start seeds in, and I also have a grow light that I used last year, which was a big help and I will use again this year. I like to start a few more seeds for each kind of plant than I actually want, in case they don’t germinate correctly – it usually works out ok, and if I end up with some extra plants that is fine. I started 15 things today, 135 seeds total. I like using the peat pellets, that you “grow” with water and then press the seed into. They usually work pretty well. With my extensive garden plan, I figured I need to plant around 700 seeds this year – I ended up ordering 10 seed trays and a box of 1000 peat pellets. Today I used two full trays and part of a third one – the rest of that third tray will house my refrigerated seeds too, once they are ready to come out of the fridge. The table where the seeds are germinating used to be my cat’s window seat, and this is his first spring with us. Hopefully he won’t jump up and knock them off – I put things up to block his access for now. I love seed-starting time. We still have snow outside but when it’s time to plant seeds it makes me feel like spring is really here.